Worked with ADT in-house development team to architect and design product recommendation/online quote system for residential and business customers. Took 45+ fields on sales form, reduced it to 23 key questions further organized into 12 simple slides. Questions grouped into three parts: about the home, the family and additional services. Intro slide and progress bar set and maintained user expectations of time needed to complete. 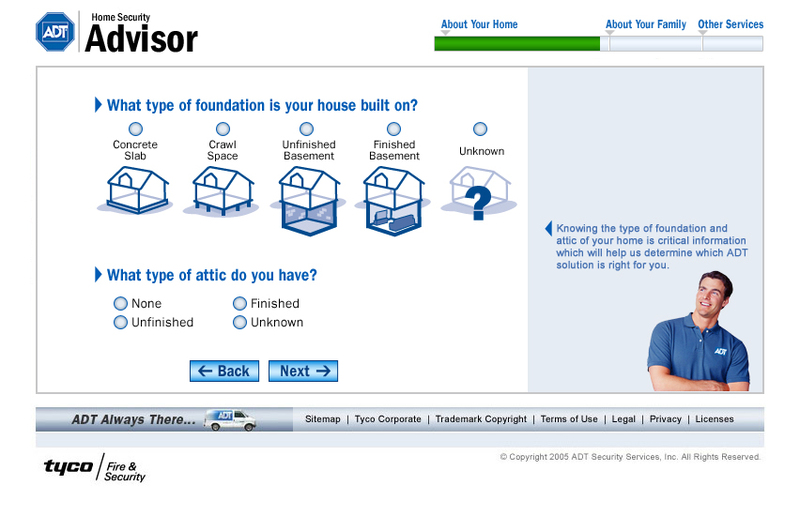 Personalized system with an ADT expert, providing tips through the process. Identified atypical answers that trigger a preemptive alert, giving user the option to contact sales team via Schedule an Appointment form, forwarding the info collected thus far.